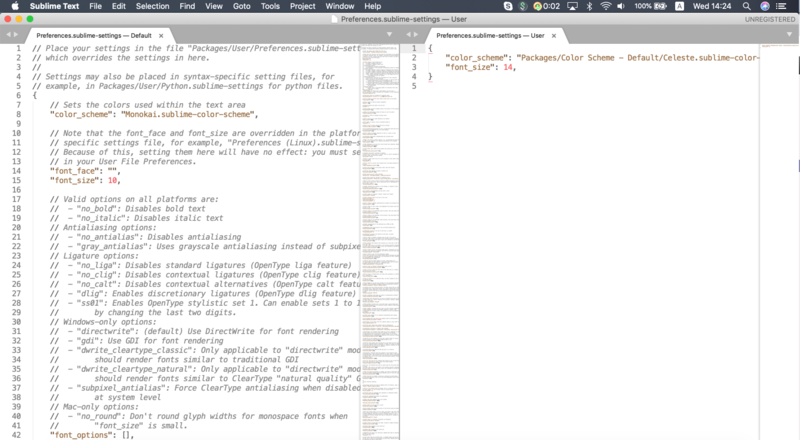 Sublime Text 3 how to change the font size of the file sidebar? The answers are omitting the square brackets, in the case one is creating the file from scratch. For reference, here there is the full file (as found in ST2). After changes, you have to restart Sublime Text for it to take effect. Navigate to Sublime Text>Preferences>Browse Packages. You should see a file tree. Open that file and find the "class": "sidebar_label: entry and add "font.size". I followed these instructions but then found that the menu hover color was wrong. How to change default code snippets in Sublime Text 3? Default.sublime-theme file works unless you have installed a theme. If you did, go to your theme's github repo and download the your_theme.sublime-theme file and put it in your 'User' folder. In that file, find "class": "sidebar_label", add "font.size":16 to that section. Some limited flexibility is available if your using the Afterglow Theme. You can edit your user preferences in the following way. I'm using a 4k display with a Mac which makes tab titles & sidebar difficult to read. 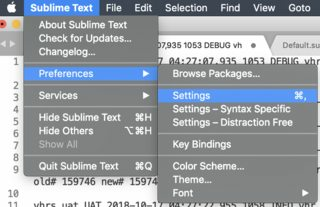 I used the menus Sublime Text -> Preferences -> Settings which opens two files: Preferences.sublime-settings--Default and Preferences.sublime-settings--User. // this to take effect. // restarted for this to take effect. "dpi_scale": 3.0 did nothing on my Mac "ui_scale": 1.5 worked well. The following is my User file. If you want to change the font size then simply follow. Preferances-> Default File preferences. After find Font properties like font Courier New 12 we (recommend to use CTRL+F) then change size of it. Click save and instantly you can see the changes. Not the answer you're looking for? Browse other questions tagged sublimetext sublimetext3 or ask your own question. How do you change the folder and menu font-size in Sublime Text 3?